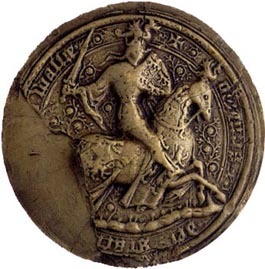 The royal great seal of Owain Glyn Dwr only survives in a single impression attached to his 1404 treaty with Charles VI of France. It is of very fine workmanship - perhaps it was commissioned in France. 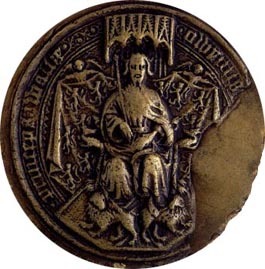 On the obverse, Owain is shown enthroned beneath a canopy of state, holding a sceptre, but with no crown. A lawyer by training, here he represents the role of a king as the giver of justice. As in French royal seals, angels hold up his cloth of majesty, which shows the lions rampant of Gwynedd. His feet rest on two more lions, and two wolf heads spring from the arms of his throne. On the reverse, Owain appears on horseback as the warrior and feudal leader he also was - this time with a crown on his helmet. The Welsh dragon appears on both his helmet, and on the warhorse's head. The legend is now incomplete, but (putting the two sides together) probably read OWYNUS DEI GRATIA PRINCEPS WALLIAE - 'Owain, by the grace of God, Prince of Wales'.